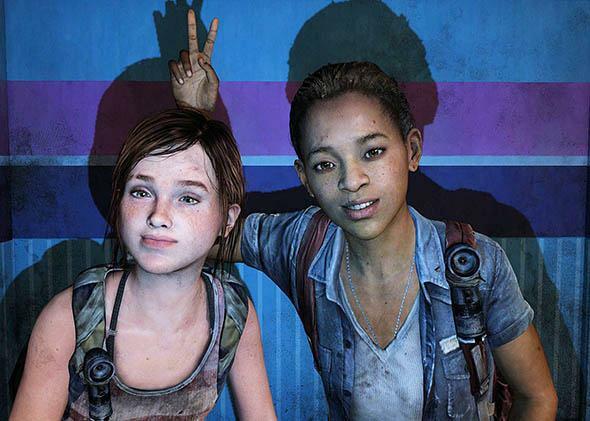 The year in gaming 2014: The Last of Us Left Behind is the best video game of the year. Entry 1: The best video game of the year? A heartbreaking downloadable bonus chapter for a zombie shooter. A scene from The Last of Us: Left Behind. When Slate let me browbeat them into starting the Video Game Club seven years ago, I never imagined I would actually become a video game critic. I was just a guy who played games and sometimes wrote about them for Slate, which has, on and off for the past 15 years, long allowed me to expound dilettantishly about my interests. But in 2014, for the first time in my professional life, I did almost nothing but play video games and write about them (or edit about them), in the New York Times and elsewhere. So, after a two-year Video Game Club hiatus, we’re back! And, in the way of such things, I now feel I know less than ever. The year is rapidly closing, and I haven’t played one second of Far Cry 4, and hardly more than that of four smaller games that I’m nearly certain I would enjoy mightily: Valiant Hearts, Never Alone, This War of Mine, and The Talos Principle—a game I liked so much when I spent 30 minutes with it at E3 that I included it on my best-of-show list. Nor have I touched any number of well-received games, including Rusty’s Real Deal Baseball, Bayonetta 2, The Vanishing of Ethan Carter, Shovel Knight, and Hatoful Boyfriend. If there’s a theme to be gleaned from that list, it’s that mobile and tablet games are no longer second-class citizens. While I certainly spent time with my Xbox One, my PlayStation 4, and my Wii U, this was the year I found that I couldn’t stop playing games on my iOS devices. A majority of the titles on my list—all but Titanfall, Wolfenstein, South Park, and Left Behind—could be played on an iPad. Hearthstone, the free-to-play card game from Blizzard, stole more of my time than any other game this year. The existentially bleak Desert Golfing came in at a close second. But there are also games for the iPhone and iPad that are (like The Walking Dead and The Sailor’s Dream) filled with narrative ambition, rather than addictive gameplay loops. Nos. 2 through 10 on my list are basically interchangeable. Tomorrow, you might convince me that Titanfall was the second-best game of the year, or that Broken Age was the 10th-best. But I can’t imagine any of them dislodging Left Behind, a short prequel to 2013’s The Last of Us that is, in my view, being neglected on this year’s best-of lists because it was released as, horror of horrors, “downloadable content” (an add-on or expansion, purchased over the Internet, to a previously published game). But why can’t a title that was released as DLC be the best video game of 2014? Left Behind takes the zombie-killing gunplay mechanics of The Last of Us and uses them to convey the giddy, girlish fun of a shopping mall romp—albeit a post-apocalyptic one. The scene in the game in which Riley narrates the imaginary action while Ellie pretends to play a broken arcade game is as quietly confident and gorgeous as any in the history of the medium. Nothing else I played in 2014 comes close to breaking my heart the way Left Behind did. Laura, what was your favorite game this year? You’ve written eloquently on Left Behind. Did you swoon for Dragon Age: Inquisition or Middle-earth: Shadow of Mordor, like so many others? More important (to me alone, perhaps), among my list of guiltily unplayed games, what should I spin through in the less than 72 hours before the year is out?